They make an unlikely couple. Nathanael West, an author whose comic sensibility is so dark it can be difficult to find. And Eileen McKenney, a Midwestern girl whose big city adventures spawned a miniature empire. Theirs may not have been a “screwball world,” as author Meade subtitles her joint biography; West and McKenney both died too young in a car accident caused by West’s notoriously bad driving mere days before the debut of the play that would make Eileen’s exploits even more famous. But Meade’s telling has that tone. She writes with an informal, almost jaunty voice that suits what is ultimately a tale of kindred spirits finding each other, and prior to that a recounting of literary circles in 1920’s New York and ‘30s Hollywood. The most interesting material is about those orbiting the star-crossed twosome, like West’s overbearing mother and Ruth McKenney, the staunch Communist who gained her greatest fame chronicling her superficial sibling’s antics in My Sister Eileen (filmed twice, adapted into a play and later the musical Wonderful Town). It’s the rare biography that makes you think less of its subject – well, one of them – but it happens here with West, who comes across as pretentious and scheming. Amazingly, a stint in the Poverty Row salt mines matured him. The Day of the Locust, with its parade of grotesques and apocalyptic sense of alienation, is a book I respect without actually liking. Give me the realistically grim but more humane work of West’s Republic Pictures stablemate Horace McCoy. West’s greatest success as a screenwriter is, ironically, one of the first disaster movies. In Five Came Back he mixed disparate types – among them a gangster’s young son, his pistol-packing “uncle,” an anarchist and the lawman escorting him to his execution, plus Lucille Ball as a woman who’s been around the block with an EZ Pass – on a doomed airplane. Spoiler alert: five come back. The film plods in its early stages, serving as a better showcase for director John Farrow than West. But tropes become tropes for a reason. Once the plane crashes and the action moves to the jungle, the stock characters become more involving. West, expecting to receive sole credit, was dismayed to find himself sharing space with, among others, Dalton Trumbo, who transformed the anarchist villain into the voice of reason. 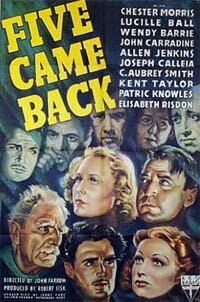 Five Came Back was the sleeper hit of 1939, launching Farrow to the A-list. (ASIDE: Want to read about Farrow’s glory days? I wrote an article about them that’s in this book.) He would remake the film nearly 20 years later as Back From Eternity. Guess what else is on my DVR?